WEYAUWEGA, Wis. (WLS) -- A piece of Chicago history turned up in a Wisconsin back yard when the restoration of an old build revealed a turn-of-the-century trolley car from Chicago. 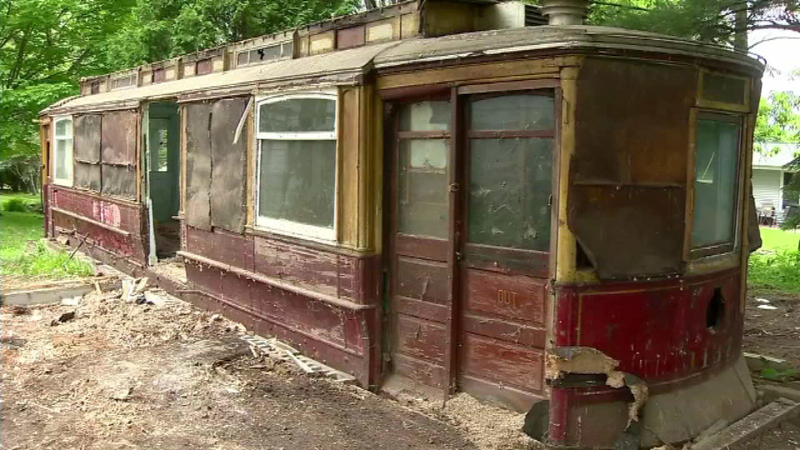 A piece of Chicago history turned up in a Wisconsin back yard when the restoration of an old build revealed a turn-of-the-century trolley car from Chicago. Sharon Krapil and her husband bought a retirement home in Wisconsin and brought in a construction crew to restore an old building in the backyard. When the crew peeled away the sides, they uncovered a trolley car underneath. "If someone is interested and taking it out and restoring it, I would be very happy, because it's like a piece of Americana," Krapil says. Historians determined the trolley was built in 1905 or 1906 by the Saint Louis Car Company. It was purchased and operated by Chicago Surface Lines, the predecessor to the Chicago Transit Authority or CTA.